Would you like to celebrate a special occasion in a paradise in El Salvador? We got the right package for that special occasion. We can even customize it. There are 27 deserted islands in the Bay of Jiquilisco. Our boat tours take approximately 30 minutes to reach an island, surrounded by beautiful scenery. Expect to see: alligators, exotic birds and mangroves, and picture-perfect volcanoes in the distance. Once you reach the beach, bathe and swim in the bay’s calm and warm waters. You could also be taken to one of the two bay deltas and swim in the Pacific Ocean. We have everything prepared for this trip: a big umbrella if too much sun bothers, chairs for resting and best of all… we can prepare a cooler with your favorite beverages. Visit the Spider monkey sanctuary- A community of cunning spider monkeys that managed to survive over the years. Spider monkeys are quite curious and fond of tourists. They will happily accept bananas from visitors and make the most of a wonderful experience. There is a diversity of packages for groups, starting at 11 people. 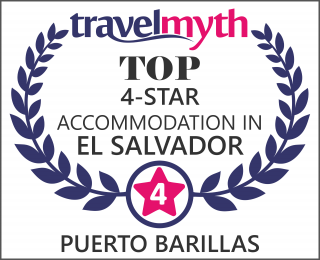 Puerto Barillas does not accept groups of 30+ during Saturdays and Sundays. All groups subject to availability (space). Niños menores de 7 años (minimo de 11 adultos): $22.00 por niño. Tour en pontoon por la Bahía de Jiquilisco a isla Pajarito/Elenas (islote, banco de arena): los visitantes podrán disfrutar de la belleza de la Bahía de Jiquilisco en un tour en pontoon, donde podrán observar una diversidad de managlares , aves dependiendo la temporada y otras especies. Duración: aproximadamente 3 horas. Visita al Santuario de Monos. Para poder confirmar evento se requiere un 50% de anticipo por lo menos 7 días antes del evento, que puede ser depositado en cualquiera de nuestras cuentas que detallo abajo o ser cancelado en efectivo o cheque en nuestras oficinas ubicadas en 79 Ave Norte y 9ª Calle Poniente # 4050, Colonia Escalón, con Verónica Jiménez teléfono 2263 3653. El complemento deberá ser cancelado el día del evento en efectivo.